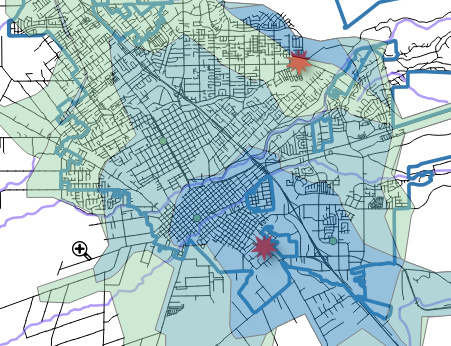 I’m using QGIS 3.6.1 and OSM Tools 1.0.2 and trying to map best response times for Emergency Fire vehicles from their various stations and show 4, 7, and 9 minute response times. The intent is if any given station can respond in 4 minutes, it should be shown that way. Below you can see two fire stations (red stars) and the resulting Isochrone run. It has the unusual result that it shows the top-right station has needing 9 minutes to get to its own location. So clearly, I’m misunderstanding or doing this wrong. If I run for single stations it works fine. It looks like there is an issue when two polygons intersect - I want the minimum time and I think it is showing me whatever polygon was calculated first. I’m not entirely sure I understand the question correctly. Please look at the attribute table of the resulting isochrone layer, every isochrone has its own feature. The green isochrone that engulfs the upper right feature of course belongs to the lower fire station. Never mind. I resolved this by changing the rendering order in QGIS. No issue with the tool at all, just a training issue on my end.